For already the third time this season, the Yankees are in Toronto for a series with the Blue Jays. After this series, they won’t visit the Rogers Centre again until 2019. Bit of a weird schedule this year. Well, whatever. The Yankees are 7-3 against the Blue Jays this season and 4-2 in Rogers Centre. A good winning percentage, that is. I’d like to see the Yankees improve on it tonight. 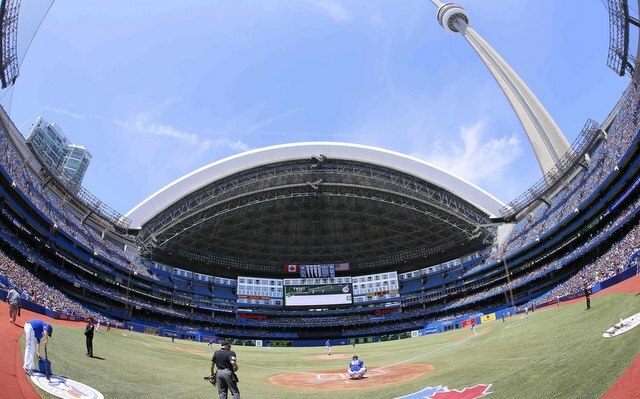 The internet tells me it is a lovely day in Toronto, so I imagine the Rogers Centre roof will be open. Doesn’t matter to me either way. Tonight’s game will begin at 7:07pm ET and YES will have the broadcast. Enjoy the game. Roster Move: Welcome back, Tyler Wade. As expected, he was called up to replace Gleyber Torres, who was placed on the 10-day DL following Wednesday’s game. Torres could resume baseball activities as soon as next week. Rotation Update: Masahiro Tanaka will return Tuesday, Aaron Boone said. CC Sabathia will start the first game of Monday’s doubleheader and the starter for the second game is undecided at this point. Could be Jonathan Loaisiga, could be Luis Cessa, could be someone else.